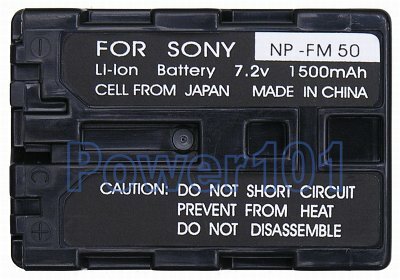 NP-FM50 is the smallest batteriy in the Info-"M" series NP-FM50 NP-QM71 and NP-QM91. FM50 fits both cameras and camcorders. In both, FM50 can replace the low-capacity FM30 that is often bundled by Sony and runs twice as long. For camcorder use, FM50 is rated about 2-hours, QM71 around 4 hours, and QM91 around 6-8 hours. FM50 is also the lightest when QM91 is the heaviest. 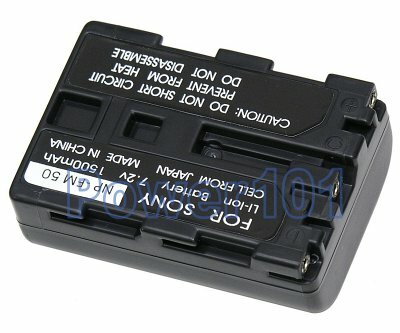 This battery is compatible with the following cameras: Sony CyberShot DSC-F707, DSC-F717, DSC-F77, DSC-F828, DSC-FX77, DSC-P12, DSC-R1, DSC-S30, DSC-S50, DSC-S70, DSC-S75, DSC-S85, Mavica MVC-CD200, MVC-CD250, MVC-CD300, MVC-CD350, MVC-CD400, MVC-CD500. It is also compatible with many camcorders such as Sony DCR-DVD101, DCR-DVD201, DCR-TRV950, HDR-HC1, CCD-TRV138, DCR-DVD100, MVC-CD500, DCR-TRV260, DCR-DVD301, DCR-TRV460, DCR-TRV19, DCR-TRV280, CCD-TRV128, CCD-TRV318, DCR-TRV250, DCR-PC110, CCD-TRV308, and many others. If your camera / camcorder is not listed - please check our camera / camcorder battery finder to see which battery you need.